Acu­lon presents its new and rev­o­lu­tion­ary solu­tion for per­ma­nent adhe­sion of bal­anc­ing leads for Alcoa Dura-Bright® wheels. 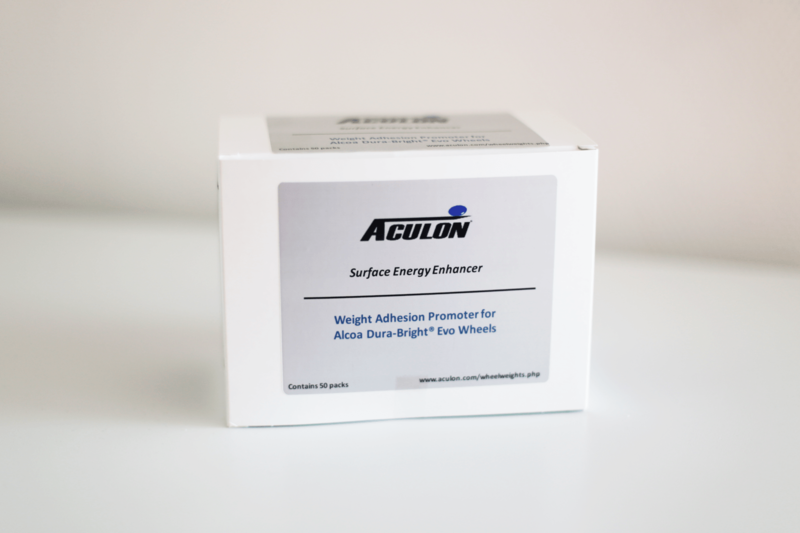 Aculon’s Sur­face Ener­gy Enhancer Wipes are the per­fect, and fast solu­tion for opti­miz­ing the wheel bal­ance process. Also, to ensure excel­lent adhe­sion between the leads and the wheel. Aculon’s Sur­face Ener­gy Enhancer Wipes are the only solu­tion avail­able that can change the alu­minum sur­face. Fur­ther­more, with­out any visu­al notice. Also, increase adhe­sion of lead to the wheel sur­face with 50% to obtain a bet­ter bond between the wheel and the lead tape. The Sur­face Ener­gy Enhancer Wipes were sub­mit­ted to tests under extreme tem­per­a­ture fluc­tu­a­tions, also extreme high torques and humid­i­ty con­di­tions. Most note­wor­thy, Aculon’s Sur­face Ener­gy Enhancer Wipes passed all tests suc­cess­ful­ly show­ing it’s excel­lent sur­face ener­gy enhanc­ing qual­i­ties. In addi­tion, in all the shear adhe­sion tests where Aculon’s Sur­face Ener­gy Enhancer Wipes were used, the taped lead weights remained fixed to the wheel sur­face. So, this shows how these wipes pro­vide increased safe­ty and reli­a­bil­i­ty on the road. There­fore, cur­rent­ly var­i­ous OEM man­u­fac­tur­ers of trucks and busses are already apply­ing Aculon’s Sur­face Ener­gy Enhancer Wipes in com­bi­na­tion with Alcoa Dura-Bright® wheels. Acu­lon, Inc. is the lead­ing provider of easy-to-apply nan­otech sur­face-mod­i­fi­ca­tion tech­nolo­gies. And, com­mer­cial­izes unique sur­face and inter­fa­cial coat­ings lever­ag­ing nan­otech­nol­o­gy and oth­er sur­face mod­i­fi­ca­tion tech­niques. Aculon’s orig­i­nal focus was the opti­cal indus­try devel­op­ing treat­ments of pre­scrip­tion eye­wear, sun­glass­es and oth­er optics. There are now three core focus areas: Elec­tron­ics, Oil & Gas and a Spe­cial­ty treat­ment busi­ness. The Surface Energy Enhancer Wipes are available and on stock at CAPLINQ.COM! Should you have ques­tions, or require more infor­ma­tion, please feel free to con­tact us.